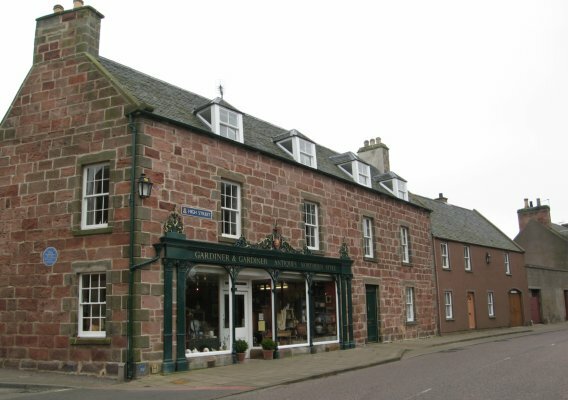 Cromarty High Street @ High.St - High Street shops and High St businesses. Large Google map of Cromarty High St.
Cromarty is on the tip of the peninsular on the Black Isle about 25 miles (40 km) from Inverness. The town looks out over the Cromarty Firth. Cromarty itself has a long history, the town prospered under George Ross, a successful army agent from London who capitalised on Cromarty's deep natural port to bring in flax and hemp from Russia. He set up a profitable factory in 1770 to turn the hemp into material for making cloth, mainly used in the transportation of foodstuffs. Cromarty prospered at this time and was largely rebuilt and many new buildings, such as the Courthouse, and the harbour were added. Once the factory closed the area started to decline again but built up once more when the oil platform work started at the Nigg engineering yard, a short ferry crossing across the bay. Cromarty is also well known as the birthplace and home of Hugh Miller, a geologist, writer and folklorist. The cottage where he was born is now in the care of the National Trust and is open to the public. Most recently, Cromarty East Church was featured on BBC's Restoration Village, where a campaign is under-way to restore this old and historically important church. All the shops along Bank St, High St and Church St are shown below.